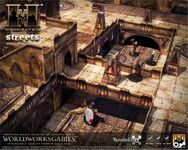 Himmelveil Streets is the foundational, fantasy street and city infrastructure setting you’ve been dreaming of! A setting of previously unheard of modularity and flexibility, two years in the making! Utilizing WorldWorksGames exclusive TerrainlinX system, Streets allows you to create true multi-leveled layouts of any configuration and to any height. This isn’t just static boxes and inflexibly structured building shapes; this is reusable tool-set and an endless torrent of possibilities in all shapes, sizes and dimensions. And best of all, when you’re done everything stores flat! Create a complex network of streets, a townsquare, city halls, city plazas, open air city buildings, foot bridges, street bridges, fortified walls, city outlooks and guard towers. Lift out structures or streets with ease to reveal lower structures, add or remove walls for better access, change layouts on-the-fly, add other TerrainlinX friendly modelsets to the mix and create entirely new possibilities (sewers, dungeons, caves, basements, buildings). And we aren’t done yet. Currently we are developing Canals and a host of unique buildings/structures to further fill out your city streets, all utilizing TerrainlinX. One building isn’t just a building; it’s an endlessly configurable, no-limits toolset. It almost seems silly to mention this in passing but Himmelveil Streets is also automated craft cutter friendly! An industry first for this type of terrain product! This is about the possibilities! * 8 hyper detailed city wall designs in our exclusive Anti-Warp and flat-fold designs, for a wide variety of city infrastructure. * 23 expertly detailed city street tiles. In 1", 1.5" unobtrusive grid designs & No Grid variants! * Street fire lamps (in on and off states). * Street name signage (includes blank signs for custom sign design). * City stairs in 1" and 1.5" flavors. * Street Ramp to transition to other street levels. * 2-way, 3-way & 4-way wall posts. * GSD automated cutting support.